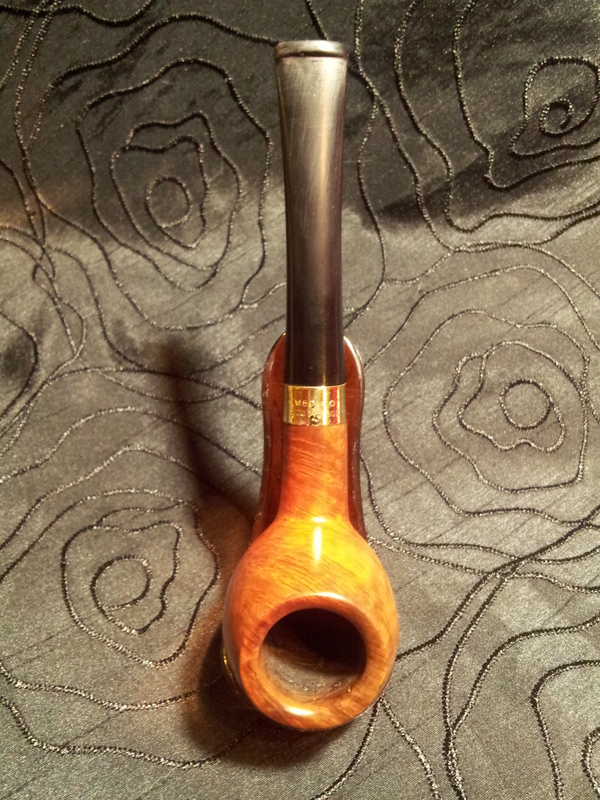 This is the first of 17 pipes I bought recently as an auction lot. 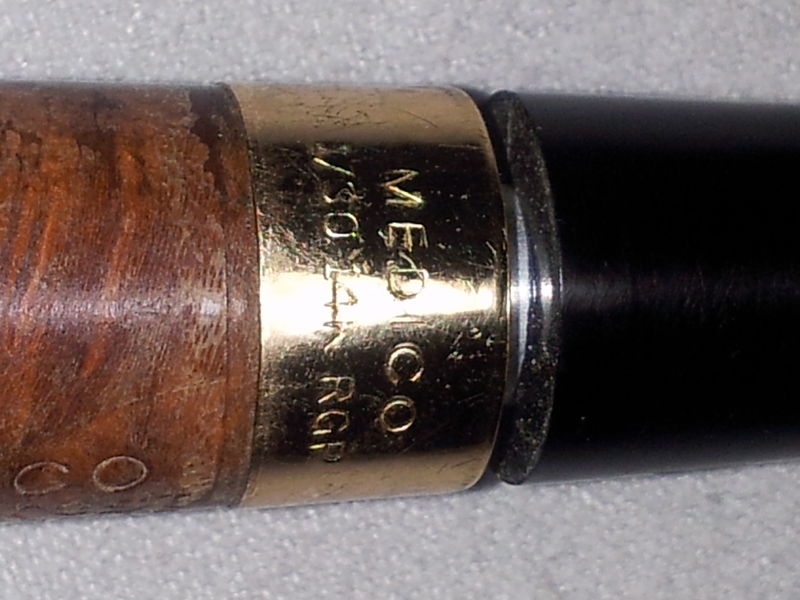 This Medico Gold Crest billiard pipe had sat somewhere undisturbed for quite some time – there were actually cobwebs in the bowl! – but it promised to be a quick and rewarding refurb job. 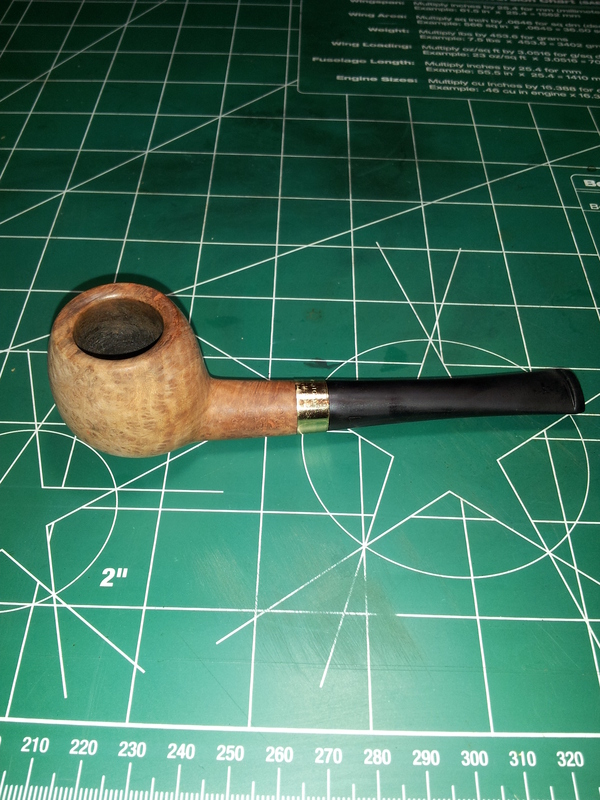 The 14K gold band and birdseye hiding under the grime and old varnish were tantalizing, and I couldn’t wait to see what the finished pipe would look like. 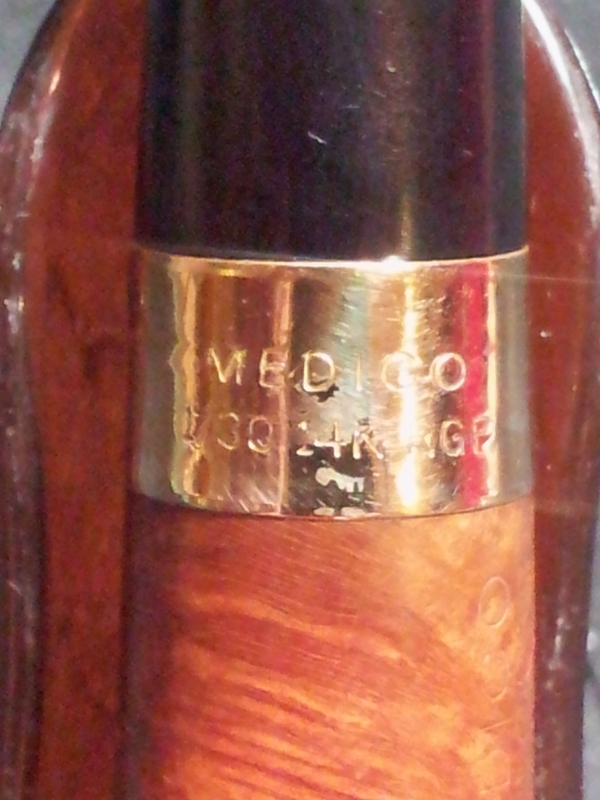 The pipe is stamped on the left shank “Medico” over “Gold Crest” over “Imported Briar”. The right shank is stamped with the pipe’s shape number, “11”. Other than the aforementioned cobwebs, the pipe showed a fair amount of uneven cake built up in the bowl, and the rim was covered in tars. 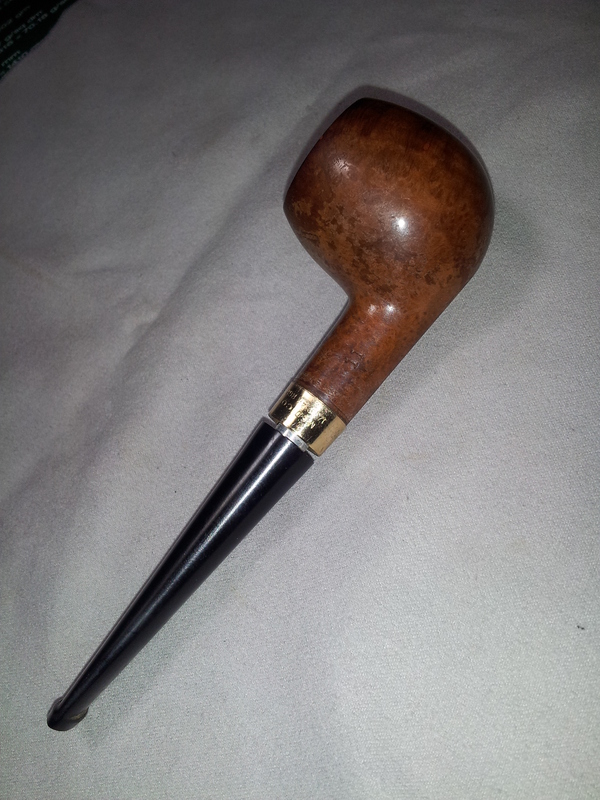 The stem was dirty, but with very little oxidation and showed only minor tooth chatter at the button end. The tenon did not fit fully into the shank, leaving a gap at the band. This turned out to be due to a LOT of tars and gunk in the shank. Internally, this pipe was a mess. 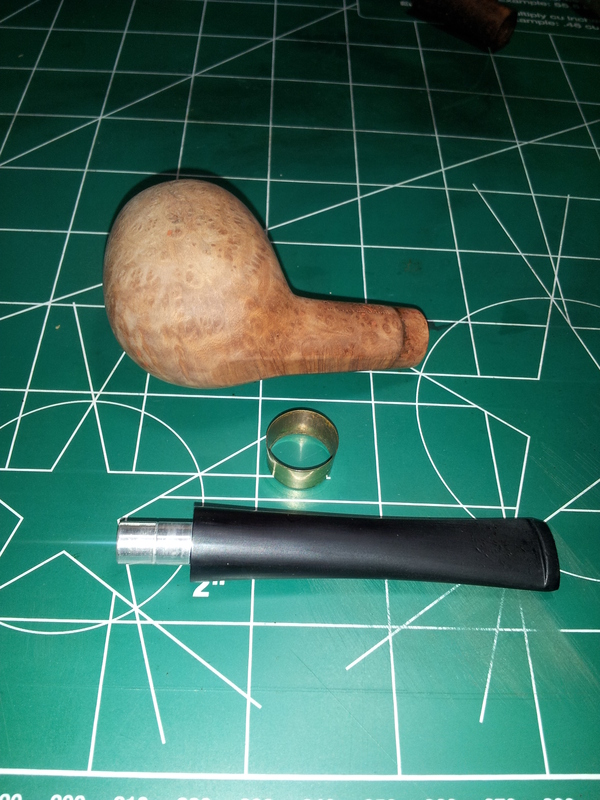 It had obviously been well-smoked for a period of time and then put away uncleaned until it hit my worktable. So onto the cleanup! 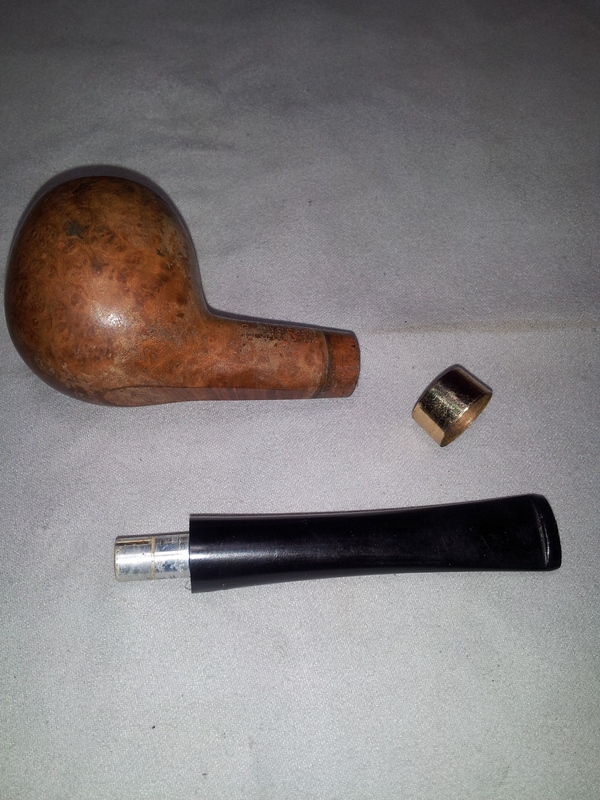 My first task was to get the stem off the pipe. It was glued in there pretty well by all the tars and other goodies in the shank, but it did eventually come off. If a stem is really stuck, I usually try freezing it for 30 minutes or more. The cold shrinks the stem and usually creates enough room to get the stem off without resorting to sterner measures. When the stem came off this pipe, the band fell off as well. Turns out it wasn’t pushed all the way on to the stummel. We’ll fix that in a bit. Once apart, the bowl went into a bath of isopropyl alcohol to dissolve the finish and soften the built-up cake and tars in the stummel. The stem went into its own bath of warm water and Oxyclean. This lifts the oxidation to the surface of the stem where it can be easily wiped away with some 0000 steel wool. 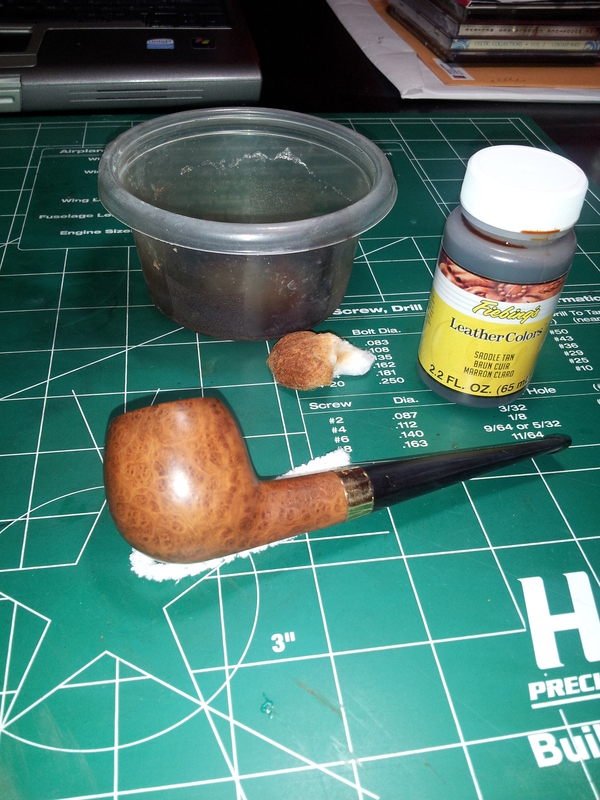 I also used a Magic Eraser to clean up the outside of the stummel and remove the tars from the rim of the bowl. The stem needed nothing more on the outside than a good scrub-down with the steel wool and Magic Eraser – rare for an estate stem. 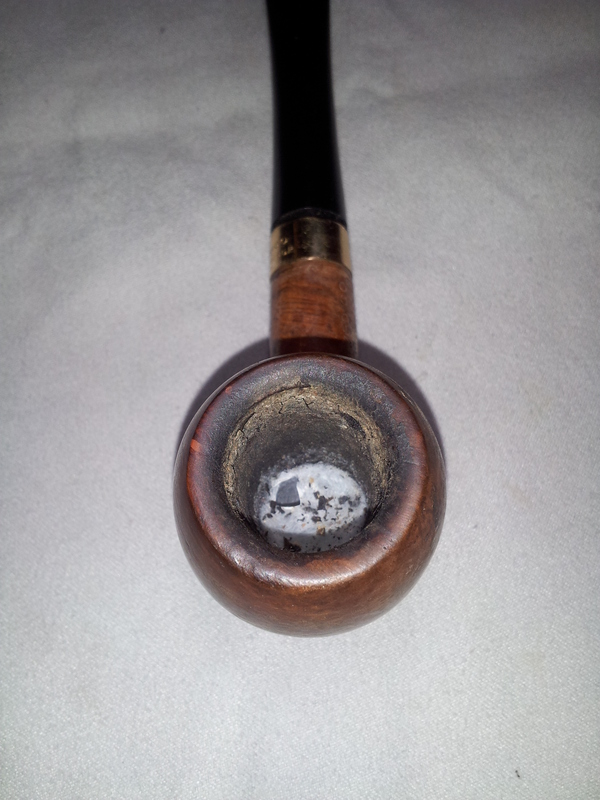 Both shank and stem needed a thorough cleaning internally to get this pipe ready for use. I used a LOT of pipe cleaners and isopropyl alcohol to cut through and scrub out the accumulated tars, oils and bits of old tobacco. It’s easy work but can take time. Just keep alternating alcohol-soaked cleaners with dry ones until they come out clean. I don’t own a reamer, so I used a pen knife and rough sandpaper wrapped around a suitable dowel to ream the old cake. 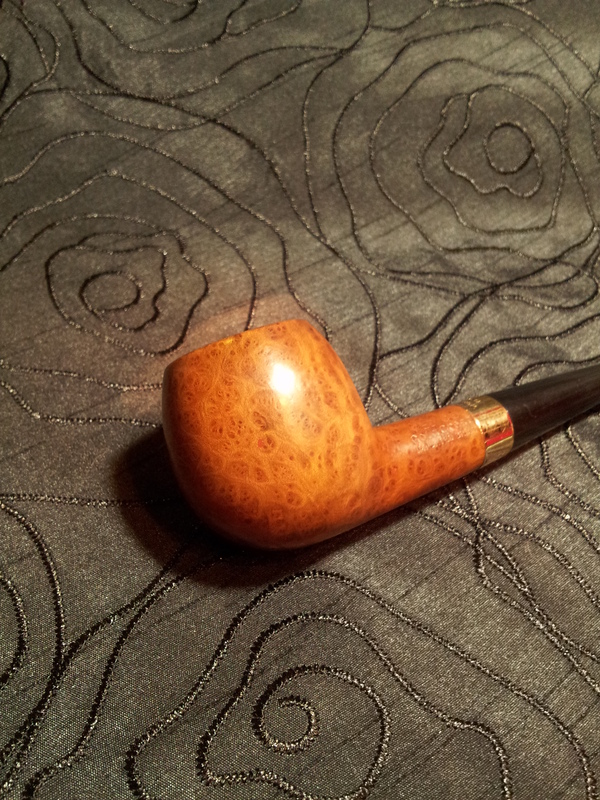 I generally take estate pipe bowls back to the briar so I can inspect the bowl for any cracks or other damage a previous owner may have inflicted on the pipe. 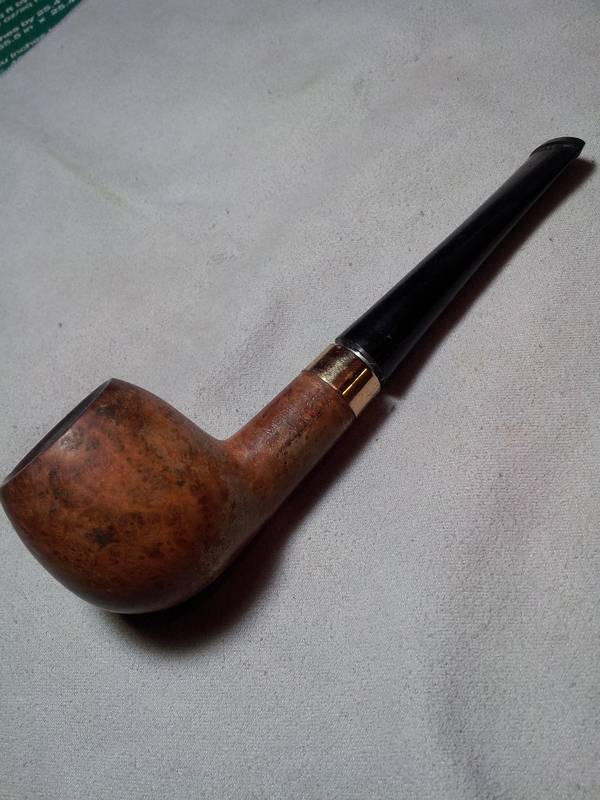 It also helps remove the taste and smell of old tobacco from the pipe. If you look closely in the pics, you can detect random flakes and patches of the old factory lacquer finish. 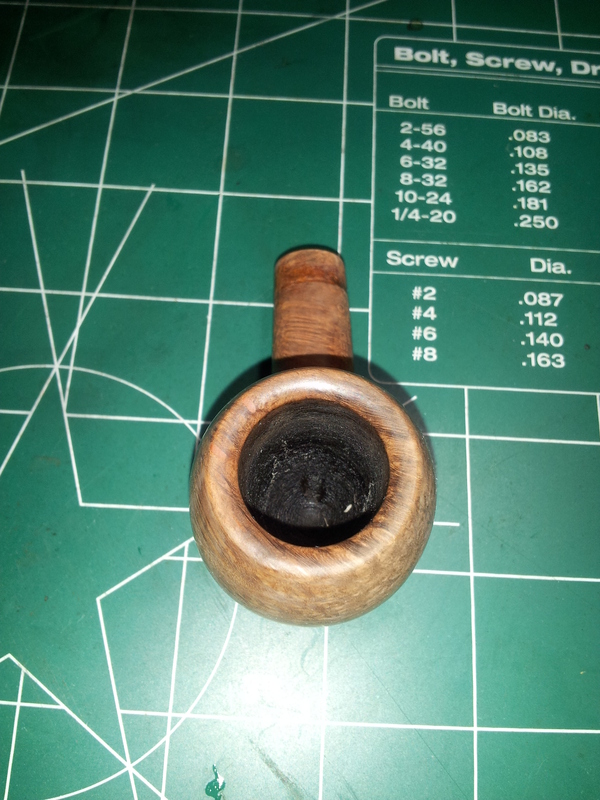 I wiped the bowl down with some nail polish remover on a cotton ball to get the last of the old stuff off in preparation for staining. You could also use acetone from the hardware store, but it can be hard to find in small bottles. Nail polish remover also smells a heck of a lot better! 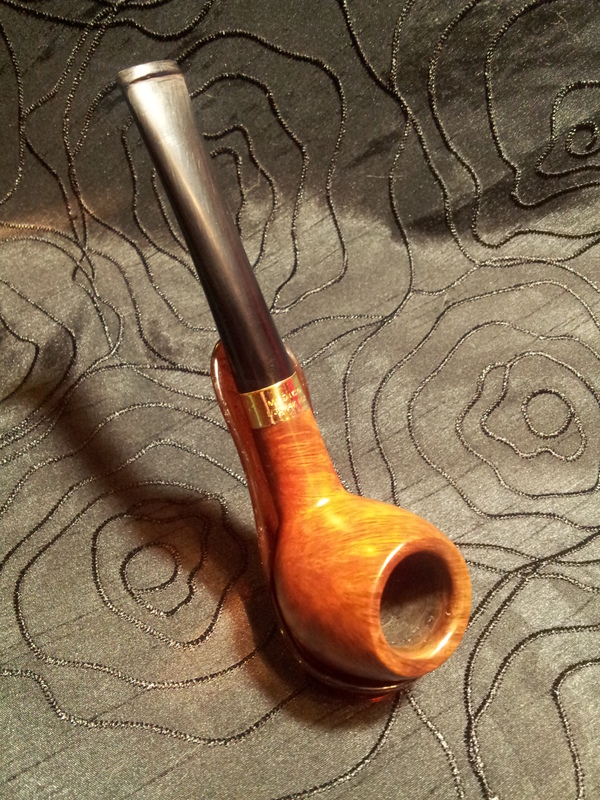 To get the stem of the pipe to seat fully in the shank after the cleaning, I needed to make a bit more elbow room. The stem has an aluminum tenon (to accommodate the Medico paper tube filter), so it couldn’t be made smaller, so I rolled a scrap of 320-grit sandpaper into a tube and gently opened up the shank until the tenon slid in easily but retained a firm grip. The pieces of the pipe fit together nicely at this point. Time to reinstall the gold band. To do this, I put it in position on the end of the shank, being careful to centre up the stampings on the top of the shank, and heated the band gently with a lighter. When it was warm enough, I pressed the band onto the shank through the simple expediency of pushing the shank end against the worktable. I put a towel between the shank and the table to protect the band and the end of the shank, and pushed the band on until the outside edge was flush with the end of the shank. When the band cooled, it was a nice tight fit not likely to fall off again. 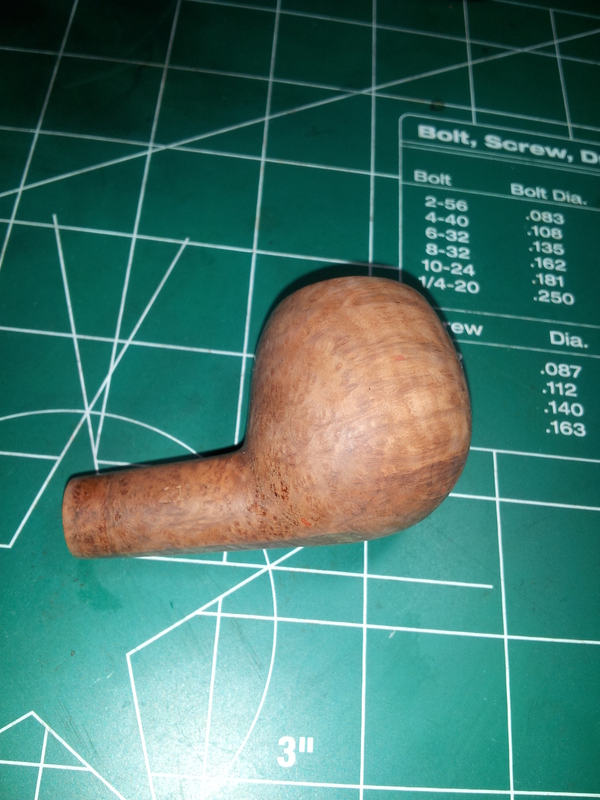 Here’s the pipe cleaned and assembled and ready for staining. 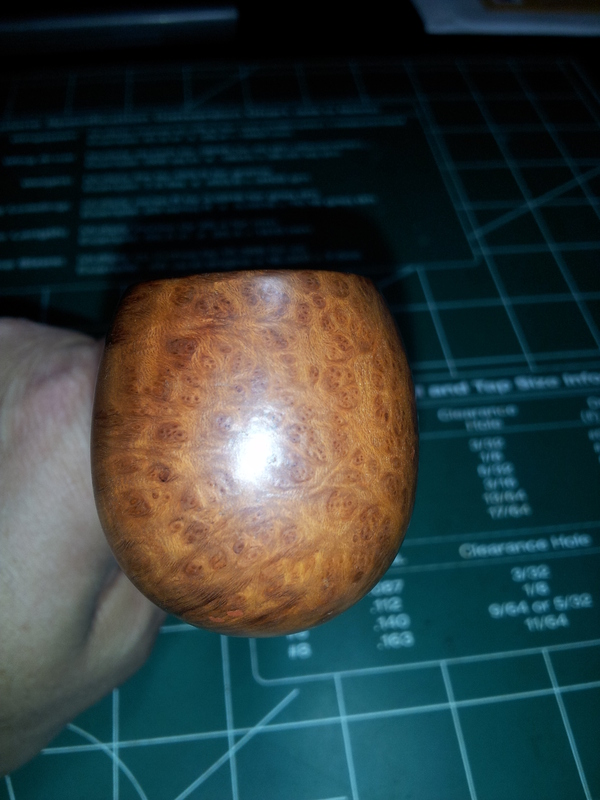 The birdseye grain did not disappoint! After the stain had dried completely, it was off to the buffer. I use 4 buffing wheels in my routine, one each for Red Tripoli, White Diamond and Wax, and one I keep clean for a final buffing to add shine. 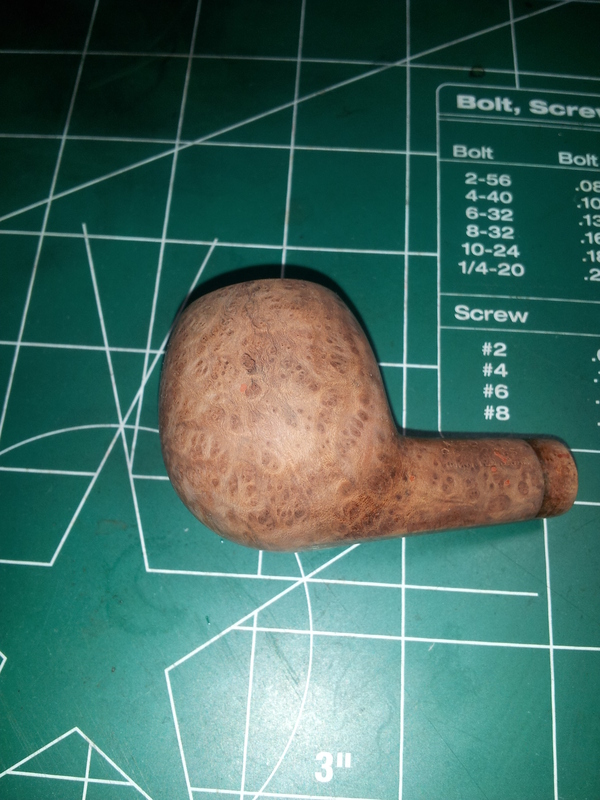 The pics show up some remaining sanding marks on the stem. I’m not positive, but I’m wondering if Medico used a nylon stem here instead of vulcanite? The stem material feels softer in the mouth, and would not take a shine like the more common vulcanite stems I’ve worked on. I need to give it a try with some MicroMesh polishing pads, which I keep meaning to pick up. Luckily, I’m only 20 minutes away from a Lee Valley store! 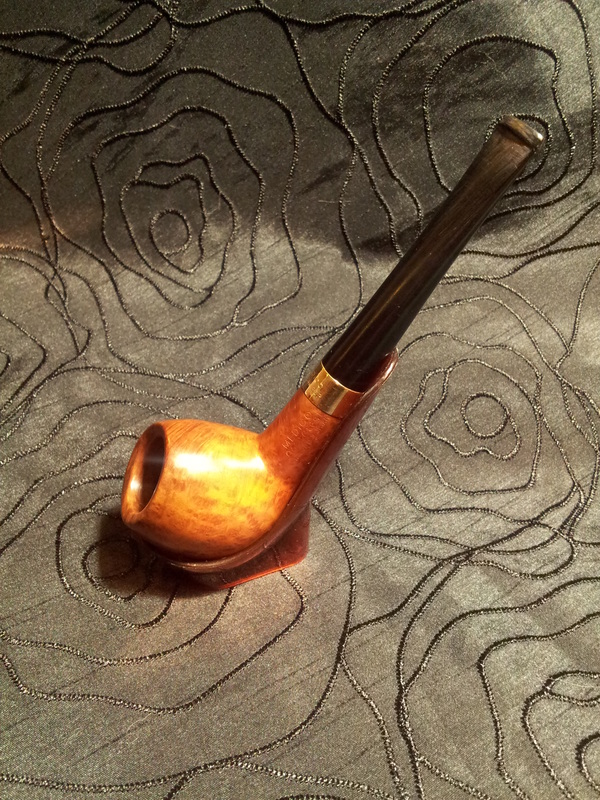 I will update this post as appropriate later, but for now, this beautiful pipe is clean and ready to be smoked and enjoyed for years to come. Those nylon stems are buggers to get the scratches out of. Nice work on that one. The bowl has some really nice grain. Trying to bid on this right now! Charles, I put scratches in a stem and posed the question on how to remove them in one of the forums. The answer I received back was to use olive oil with the micro mesh sponges to work out the scratches. Be patient and you will be rewarded. The bowl did reveal some very nice birdseye! Nice work! Previous Previous post: The Ghost of Pipe Refurbs Yet to Come!